When your business relies on fabrication equipment day in and day out, downtime can be costly. That’s why we are pleased to offer factory-certified service and repairs on a wide array of machinery. From simple maintenance to complex troubleshooting and applications engineering, our technicians are “at your service” to help keep your operation running smoothly. Contact us today to request a quote on service and maintenance for your critical equipment. Our expert team is equipped to handle a variety of maintenance and service needs. No matter what kind of machinery your business relies on, or whether you purchased your equipment from us or from someone else, they’re here to support you with top-notch, expert service. We service a variety of types of metal fabrication equipment, and with factory-trained technicians on staff, you can be sure we’ll keep your equipment in good working order. 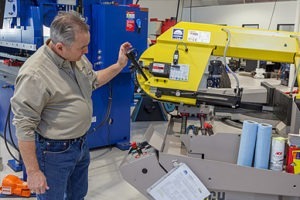 Even better, thanks to our close relationship with leading machine tool manufacturers, we have access to highly-trained manufacturer specialists who can make sure your critical machinery runs consistently and perfectly day in and day out. Thanks to our service and repair team, you can rest assured the machine tools that keep your business working effectively will remain in top working order. Contact us today to request a quote on service and maintenance for your critical equipment. We look forward to hearing from you!